Exhaustion’s Biker was a blistering a punishing record that sat high in my list of favourite albums of last year. Following that effort is a new 12″. ‘Phased Out’ is a splinter of new eardrum bullying noise-punk-meets-static-ambience that exemplifies the protean nature of Exhaustion’s work. The trio of Duncan Blachford, Per Brystrom and new(ish?) member Richard Stanley are joined in ‘Phased Out’ by Matt Barrage on electronics to bring together disparate elements into a heavy yet textured offering. As evidenced in previous long plays, Exhaustion is adept at creating an unassailable brand of dense noise, overlayed with gruff and low vocalisms. Turbulent, restless, agitated – Exhaustion revels in the soundscapes that cascade over listeners and deplete strength of will. ‘Phased Out’ again employs caustic squeal and unrelenting drums (the latter being the standout component here), which is in stark contradistinction to the song’s second movement, which is all wiry buzz and thin reverberations. 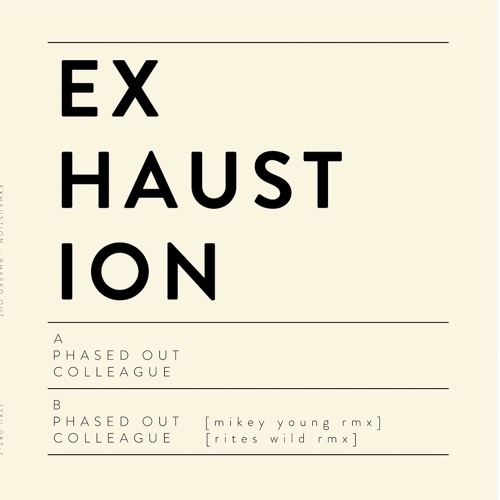 Exhaustion’s ability to exist different realms is one of the group’s signature nuances – where sharp punk threatens to evolve into free jazz noise. Trust Exhaustion to keep it all fresh, nothing sounds like what has come before and that’s really something. ‘Phased Out’ appears on a 12″ with another track called ‘Colleague’. The B-side features remixes of both tracks by Mikey Young and Rites Wild.